India beat Zimbabwe by 4 runs in the first one-day international to take a 1-0 lead in the three match series at the Harare Sports Club in Harare. The talk about the greatest Ashes series was put aside for a day when India won the first ODI against Zimbabwe on their tour of Zimbabwe for a proposed 3 ODI affair. India's second string included players mainly from the IPL arena. India's playing eleven comprised of Murali Vijay, Ajinkya Rahane(c), Ambati Rayudu, Manoj Tiwari, Robin Uthappa(wk), Kedar Jadhav, Stuart Binny, Axar Patel, Harbhajan Singh, Bhuvneshwar Kumar and Dhawal Kulkarni. Zimbabwe's playing eleven were Sikandar Raza, Vusi Sibanda, Chamu Chibhabha, Hamilton Masakadza, Sean Williams, Elton Chigumbura(c), Richmond Mutumbami(wk), Graeme Cremer, Donald Tiripano, Brian Vitori and Tinashe Panyyangara. Earlier, after winning the toss, Zimbabwe elected to field first. Ajinkya Rahane led the men in blue for the first time as a captain. 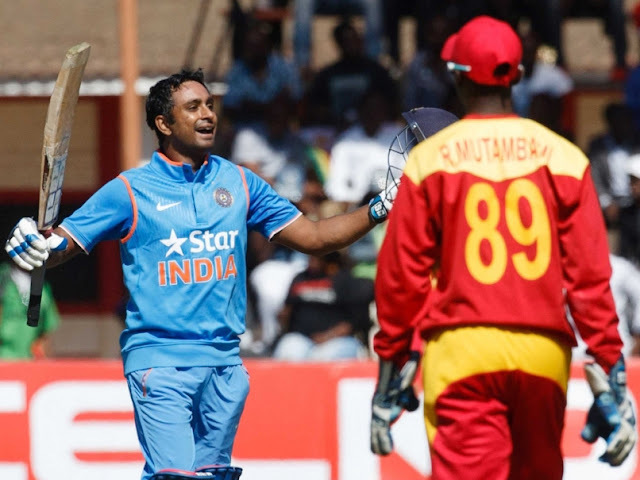 India reached 255-6 in 50 overs and set a moderate score in front of Zimbabwe. Openers Murali Vijay and skipper Rahane didn't get along and failed to build a partnership. Soon Vijay made his walk back to the pavilion. Ambati Rayudu's knock of 124 runs helped team India to put up a decent score. Rahane added 34 runs and Stuart Binny played smartly and contributed 77 runs off 76 balls. Rayudu stole the show, his wicket brought puzzled looks on the bowlers' faces. He remained unbeaten and stayed on the crease till the end of the innings. It seemed as if he was programmed to bat for team India against Zimbabwe in the first ODI. An act of brilliance, sheer class, Rayudu. The most successful bowling efforts had been made by Chamu Chibhabha. He took two wickets and gave just 25 runs like a miser in his stipulated 10 overs. Even Donald Tiripano succeeded in getting 2 wickets , Brian Vitori got one. Though team India failed to manage a mammoth score, but they excelled in bowling department. They played till the end, so did Zimbabwe. The game ended up with a nail-biting finish, and favored team India. Even Zimbabwe got one centurion on their side. Their skipper Chigumbura scored 104 off 101. The final over came up as the decider over. But Bhuvneshwar Kumar's pace attack saved his team from losing. Stuart Binny and Axar Patel got two wickets apiece and Bhuvneshwar Kumar, Harbhajan Singh, Dhawal Kulkarni bagged one wicket apiece. India won the first ODI under Rahane's captaincy. Ambati Rayudu was awarded as the Man of the Match. "It was very tough to bat in the morning. Me and Ajju(Rahane) were batting well till he got out. I knew that one had to bat through and I am happy that I took the responsibility. I was constantly telling Binny to hold back because we couldn't lose wickets at that stage. He batted brilliantly. Contributing to the team is more important than scoring a hundred." Rayudu said in the post match presentation.